After being a guest of Rob Van Vuuren and Martin Evans on Pants on Fire! show we’ve fallen in love with the intimate Upstairs venue – a passion project of the Alexander Bar boys. 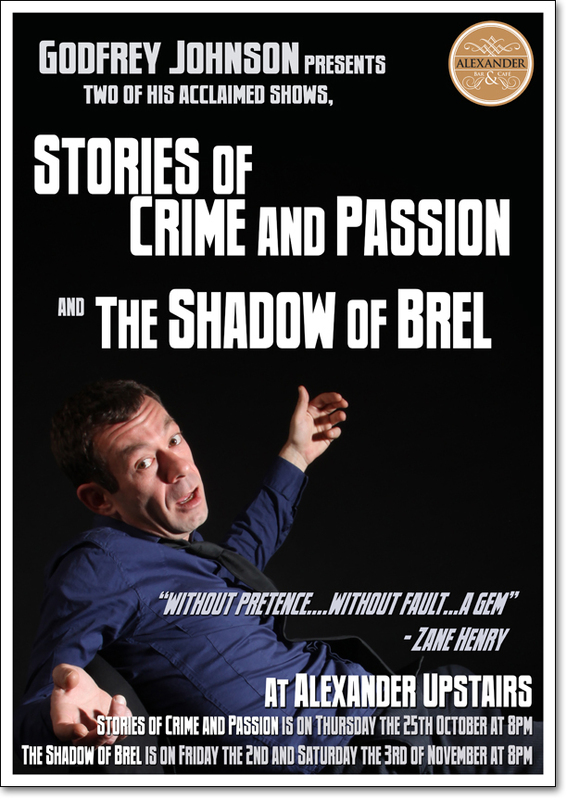 This week there’s Stories of Crime and Passion for one night only and then The Shadow of Brel for 2 nights the week after. In December The Minnie and Johnson Show will take over the space for a series of performances. Very exciting. Alexander Upstairs is the perfect space to connect with a passionate audience. You can book on the Alexander Bar website. This entry was posted in Updates and Shows and tagged Alexander Bar, Minnie and Johnson, Stories of crime and passion, The Shadow of Brel. Bookmark the permalink.